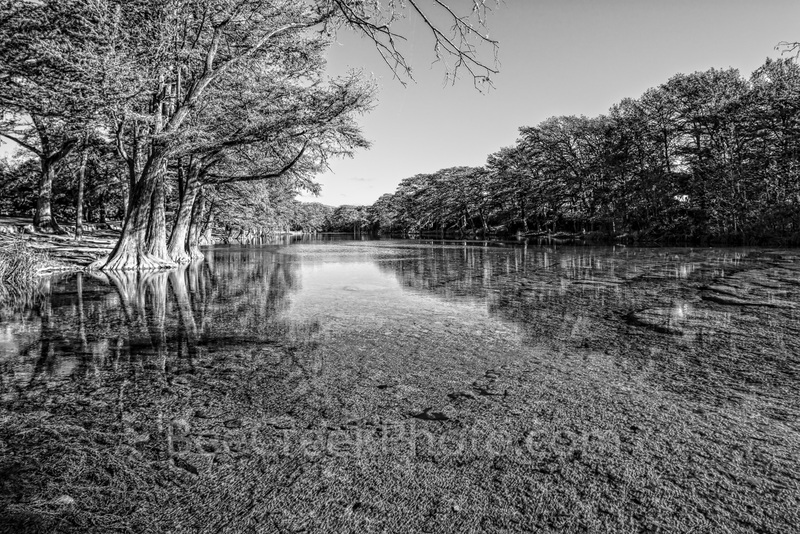 Scenic Frio River BW - Garner State Park is on of the most scenic and beautfiul places in the Texas Hill country as as I am concerned so I wanted to show how lovely it looks even in black and white. The Frio River has these wonderful clear waters and you can see the bottom if you get out early enough before the crowds show up and get the water stired up. There is a lot of limestone rocks along the bottom that help to keep the waters clear along with the fresh springs that feed into the river. My favorite time to visit is in the fall when the leave are changing and when it not too hot and over crowed. The Texas State Park have been loved to death and Garner no exception even in the fall you may need a reservation just to get in for a day visit. Photo © copyright by Bee Creek Photography - Tod Grubbs / Cynthia Hestand.